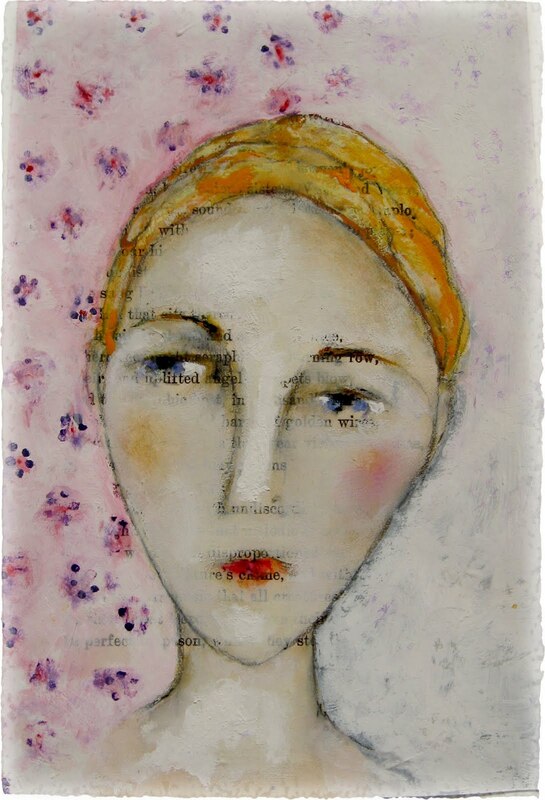 'charlotte' ~ watercolors, gouache, oil pastels, colored pencil, casein paint and graphite on page from milton poetry book - 4" x 6"
it turns out that the face i started below was jeanette's younger sister, charlotte! i had no idea! i don't think she's changed too much... i added more white gouache and cream oil pastel to her skin, but mostly i worked on fine tuning her eyes, lips, and hair with watercolors, gouache, and oil pastels. her hair is mainly pale yellow oil pastel and gamboge gouache. i like to add oil pastels to hair without blending them in... i messed with her eyebrows quite a lot, seeing which color/s looked best. all the while i was messing with stuff i was trying to figure out what her left eye (as you're looking at her) needed. finally i realized that i needed to lighten the edges of it near the outside of her face, which i did with white gouache. then she popped alive. if you click you can see the heavy white that i added to her forehead, nose, chin and neck - that's white casein paint. it's easier to get a layer of dense white with casein paint than with gouache. it's just a heavier paint. thank you for your positive responses and kind words! Its so true about the casein Lynne, It covers much better than Titanium or zinc acrylic. Its like plaster for covering in its density. I like this portrait's deep shadows around the eyes. wonderful work. How wonderful...the color is so soft. I like your idea of using the colored pencil. This does look like an oil painting. You did the eyes so well...no harsh lines...like impressionism. Wonderful instructions. Thanks for sharing! i'm really interested in casein now. I'm not totally sure i've seen it locally so i'll have to stalk around a bit. this painting *does* have a totally soft youthful appearance. Hi Lynne! I've so enjoyed your tutorial, (which I read while flossing, so you KNOW I really wanted to read it) which has answered a lot of my questions about how you manage to combine the eclectic assortment of media you use. I'm so glad you did this; I know it had to take lots of time and organization, and you did it so well! you know I adore your work, and I think a video tutorial would be utterly FANTASTIC! ... and even more work for you, I know. Thank you, and your sweet generous spirit, my friend! They all come out just the way they are suppose to..Perfect in the eyes of all us beholders.. Thank you for always sharing. She really is beautiful, Lynne. The close up photo really shows the layers well. Do you fix the painting with anything, or do you just let the oils dry over several days? Thanks again, for the tutorial. I tried it the other day and found out, once again, how difficult it is to use oil crayons for fine areas of the face. And applying watercolor, gouache and other paint is not so easy either. You have really honed your talent in a unique way. Wonderful! Hi Lynne, as your newest follower I want to gush about how much I love your work and how much I enjoyed your "how to" post. Gush, gush and gushing more! Your work is captivating. Why did it take me so long to find you? oh my, what a wealth of information. bless you for taking the time, energy, and kindness to share your techniques for painting faces. you are truly a very gifted artist. sending gratitude your way, thanks. Oh how very very lovely! and thank you for the information. I hope to try it, need to find a few of the supplies and of course some time. I did get some sumi ink that I will have to try as well...so much to do, so little time! Just now found this... loved it! thank you!! !